WRAPUP: A half dozen MINIs braved the drizzly morning to participate in the parade. We were the second to last in the lineup (thankfully ahead of the horses), and were greeted by an enthusiastic crowd with lots of children. A fun time was had by all!! The Chicago MINI Motoring Club will be participating in the Oak Lawn July 4th parade. I participated in the Windy City BMW Drivers school event at Gingerman Raceway this past weekend, and had a great time. My personal objectives were to have a good time, learn more about what my car could do at higher speeds, to improve my driving techniques, and to be able to say that I have driven my MINI to my limits on a racetrack. 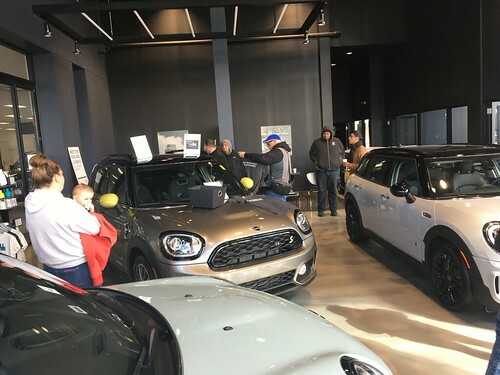 Rob from Hooked on Driving has offered the Chicago MINI Motoring Club a discount on their various track days this summer..
WRAPUP: Check out the post HERE for the event wrapup information and pictures!! The Windy City Miata Club has invited the Chicago MINI Motoring Club to participate in their Autocross event in Maywood on August 1st. We will be given a special pricing of $30, and we will be running in our own MINI classes. Check out the website HERE for specific rules and details. IMPORTANT: You are required to preregister for the event at any time from now till the Wednesday prior to the event to reserve your number and to help things work smoothly. Add a comment if you will be attending or watching so we know who’s going. Mini Meet East meets West will be held in Minnesota on June 29th thru July 3rd. This year is the 50th anniversary of the Mini, so it is bound to be a special event. Post up if you are going, and what time you are leaving, and perhaps you can hook up and caravan out there. Also visit the Minis In Northern Illinois site to join up with more MINIs and Minis! !